Wow, I just love this plant! 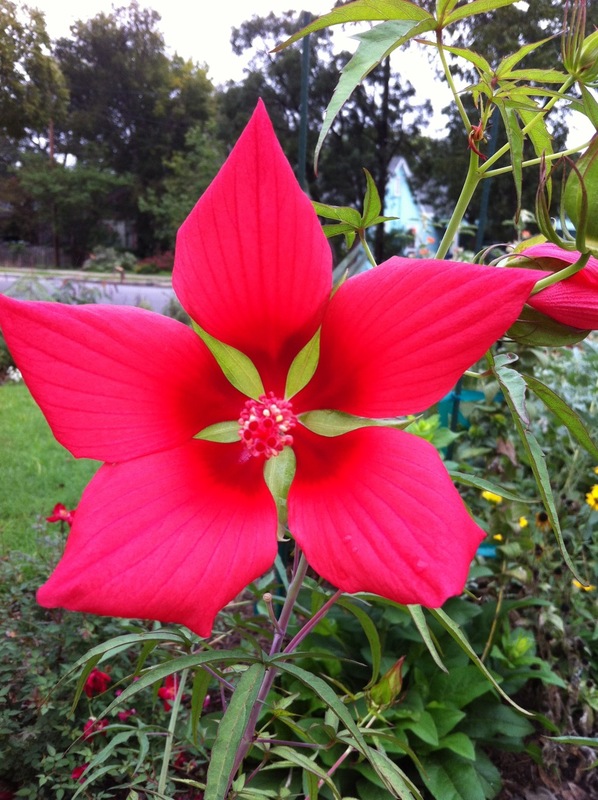 Texas Star Hibiscus loves sun and needs moisture. I planted this mid-June – it was a 4″ plant and now on October 18th (4 months later) it’s about 4′ high and producing lots of flowers. They are brilliant red. Typically, the flowers only last about 1 day as they are pretty fragile. But they open up and are quite impressive, as you can see below. I love this plant so much, I planted another in my backyard. During the summer, this area was watered 1-2 times a week with automatic sprinklers but now I am not watering unless things look droopy. It seems to be doing quite well. The native of the week is cenizo (Leucophyllum candidum), which is a shrub. This plant has silvery leaves that are soft a little bit like Lamb’s Ear (non-native) but the leaves are much smaller and tougher. 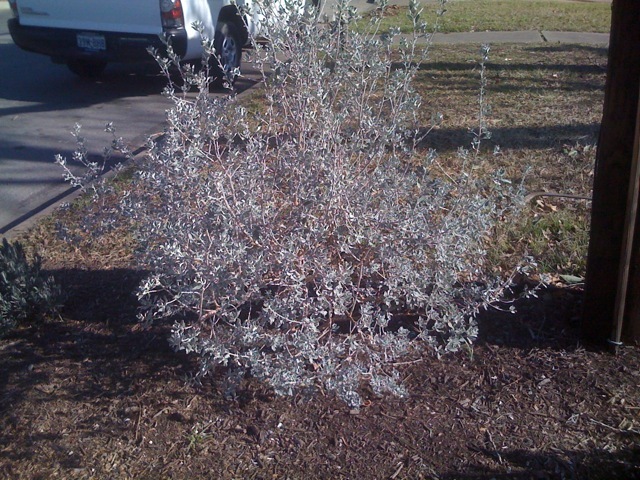 This plant can add silvery foliage to your yard which is a nice change from the normal green, and this plant is a perennial so you’ll have that color year-round. Cenizo likes almost any soil type including gravely areas or clay. 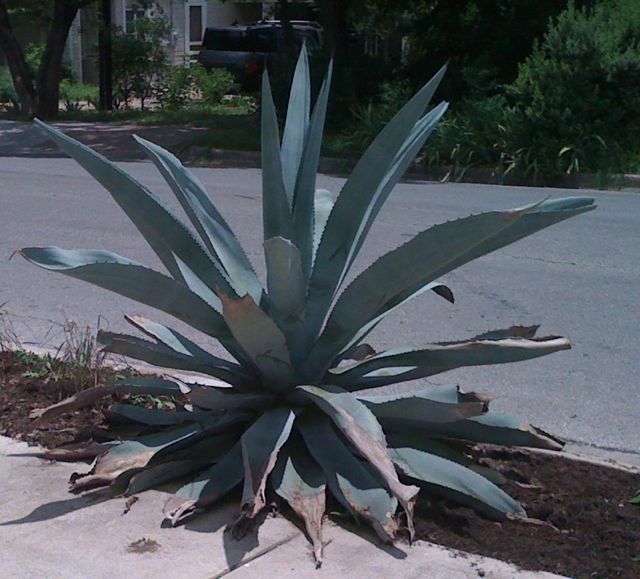 It has low water requirements and can also tolerate part-shade. The coolest part of this shrub is a feature that underlies its name “barometer bush.” When we get heavy rains, the bush will push out purple flowers, thus showing an indication of the barometer. 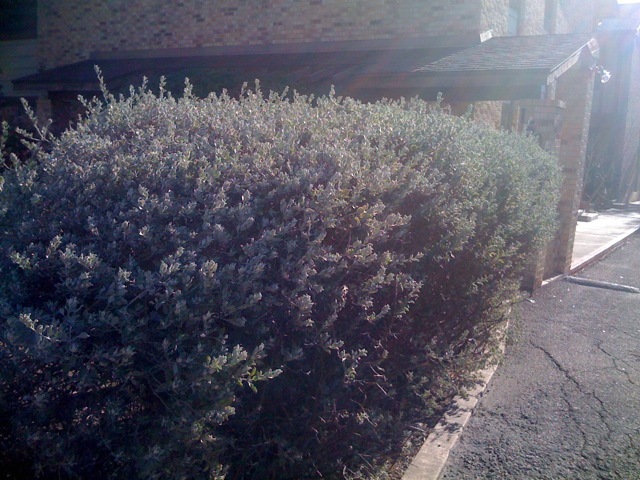 This shrub can provide nesting site and cover for birds and animals, and the flowers provide nectar for insects. You can grow this plant into a hedge, as is depicted in one of the photos. Or, you can make it more a taller, rounder shrub amongst a collection of other plants.